In addition, it allows more efficient heat supply with power assist of our unique technology. Excellent heat supply. 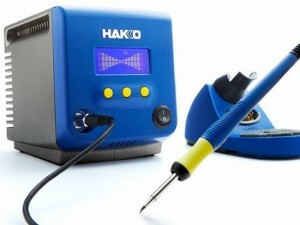 Ideal for the most challenging soldering jobs. The HAKKO FX-100 features IH (induction heater) that continuously powers the soldering iron and maintains the set temperature by automatically detecting even minute drops in temperature, plus HAKKO’s proprietary Power Assist function. The FX-100 soldering system achieves powerful thermal recovery even with fine-shaped tips. It provides excellent thermal responsiveness that conventional IH and sensor feedback systems systems cannot offer. Unlike conventional temperature setting systems, every tip in the lineup is fixed at either 400°C or 450°C. This makes managing the set temperature of the soldring iron easier than ever. Like the HAKKO FM-206, the HAKKO FX-100 features an LCD display for easy operation with no need for an instruction manual. In profile setting, solder type and diameter can be registered as well as station ID and user name.